Great deal has come on flipkart about Moto e, The regular price of Moto e on Flipkart is 6999 Rs, but now you can get moto e for just 5999 Rs and save full 1000 Rs by grabbing this whopping Flipkart android phone deal. Moto e is running on Android 4.4.4 kitkat, but soon it will have official lollipop update in some days, so it's a great deal in the 6000 Rs budget with 1 GB RAM, 4.3 inches Touchscreen and much more Specs. Moto e Camera have good quality 5 MP Resolution, which is quite good, and there is no secondary camera in motoe. Moto e have a much better specs than the other same budget phones of micromax, nokia or karbonn, 1.2 GHz MSM8x10 Dual Core Processor makes a great impression in Moto E specifications with the butter flow user experience. Dual SIM slot option another killer moto e specification is on the list. Another reason for buying moto e over karbonn, spice or micromax is the credibility with the Motorola brand, and you are getting all the major specifications in this price range. 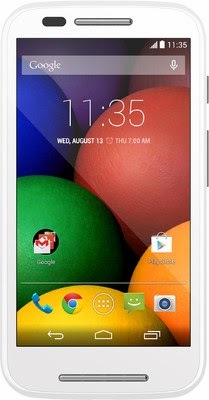 Now with 1000 Rs discount, it's a must buy deal in this price range of 5999 on Flipkart.